This is based on a previous thread, and I thought to make a new thread on the topic, sharing some of my knowledge and thoughts. Some of you living in zone 8 may be wondering if it's possible to grow an orange tree outside, or whether there's any kind of orange tree hardy down to zone 8a. Well first, let me explain something. The most common citrus that people normally want to grow, oranges, regular lemons and limes, these are some of the least cold hardy citrus varieties. It's no wonder then that there's a common perception that citrus doesn't grow in zone 8, because normally when people have tried growing citrus, these are the types they have tried. Now, before I explain further, I would like to share an optimistic story with you. A tree that Juana Delgado grew from the seed of a grocery store orange has become a miracle on 15th Street. 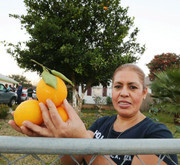 This month, Delgado’s family has harvested an estimated 600 oranges from the tree she planted 15 years ago when she moved into the Habitat for Humanity home near North 15th Street and Colcord Avenue. In recent weeks, the family made big jugs of orange juice, shared fruit with passing vagrants and sent their children door-to-door to give away large bags of juicy oranges. The tree has defied the conventional wisdom that oranges can't survive the Central Texas winter, when temperatures usually dip into the low 20s. But the tree has soldiered on, even through a January 2010 cold snap when temperatures plummeted to 8 degrees. "Many people said it’s not possible," Delgado said in Spanish. "I say, 'Come look. It's possible.'" Mark Barnett, a McLennan County master gardener and a landscaper by trade, said he has seen many people try to grow citrus trees they bought from big box stores, but the trees usually freeze and die. "It's very unusual for it to have survived that long without protection," he said. "We've had some extremely cold winters that should have killed it." Delgado started the orange tree in a pot using a seed from an orange she bought at an H-E-B supermarket. Most table oranges are improved hybrid varieties and tend not to reproduce faithfully by seed, Barnett said. But Delgado's oranges turned out sweet and flavorful. Delgado has been harvesting a few oranges a year during the last decade but got her first big harvest two winters ago: A basket and a box full. In the 2011 drought, she kept the tree alive by watering it but ended up with only three oranges that season. This year, she hit the jackpot. Her children and grandchildren climbed ladders to pick the fruit and filled six boxes with about 100 oranges each. Waco, Texas, is in zone 8a, and is just a little south of Dallas. Although in recent years the 8b zone has been moving north, first the southern half of Waco was reclassified into zone 8b, and now on the latest maps zone 8b has engulfed the entire city. So now you know there's some hope an orange tree may be able to survive in zone 8. But don't get your hopes up because this is zone 8 in the American South and Texas. All the heat during the growing season (mostly because the growing season is longer) helps the citrus put on a lot of growth and better recover from the Winter. And there may be the odd year once in a while, with an exceptionally cold Winter, where your tree is going to killed to the ground. That's the type of climate that exists in the Southeast and Gulf Coast. But now going back to the original topic. Are there any type of Oranges that are more hardy? Or are there any orange-like citrus that are more hardy? The only actual orange that I'm aware of that has a good chance of surviving in zone 8a is Chinotto orange. It's actually more of a sour orange, the type good for making marmalade. You can eat it, but it's not as good eating quality as a regular orange. Tangelos have more cold hardiness than oranges. I'm not saying a tangelo is going to grow well in zone 8a, but it's probably going to have a much better chance than orange. Minneola tangelo has great flavor, but Orlando tangelo is known to have slightly better cold hardiness than Minneola. In general, mandarins (sometimes called "mandarin orange") are more cold hardy than oranges. Not incredibly cold hardy, but mandarins can be commercially grown on the border between zone 9a/8b. If you're interested in juicing, FF-6-15-150 is a newer one that came out of a USDA breeding program in Florida, and is rated to be as hardy as the cold hardiest commercial mandarin varieties. It was in large part bred from Orlando tangelo, is said to have great flavor, though seedy and on the small side for an orange. But it's not commonly available to the public and may be difficult to get your hands on. Calamondin is believed to have originated from hybridization between kumquat and orange. It has more cold hardiness than orange, can grow in zone 8b, and has a chance of growing in zone 8a (maybe not as well). Mandarinquat is similar, it's a hybrid between kumquat and mandarin, and has slightly more cold hardiness than calamondin. The inside flesh of a mandarinquat is better than a kumquat, but although it can be eaten like a kumquat, the skin is a little bit tougher and not as good. And of course this section wouldn't be complete without making quick mention to Nippon Orangequat (a hybrid between kumquat and Satsuma mandarin). It has the best chance of doing well in zone 8. Changsha mandarin and Citrange (a cross between Orange and bitter Trifoliate Orange) are two more pretty cold hardy ones that are distantly orange-like, sort of, if you're willing to drastically lower your expectations of fruit quality and flavor. There are many other citrus varieties that have more cold hardiness but none of them are really "orange-like", so we won't really go into that discussion here. Have you got sow seeds or graft for test elsewhere ? I dont know the climate of Texas but the summer period must allow him to grow well. Nippon Mandarinquat (commonly goes under the name "Orangequat") is a cross between Meiwa kumquat and Satsuma mandarin. It's cold hardy, able to survive down to 14 °F. They say it is quite cold hardy in zone 8b and should prove reliable in zone 8a most Winters. It's so interesting to hear of the 'exceptions to the rule', isn't it? I lived for many years in Beaufort, just a bit north of Savannah. Much to my surprise, I found (over the years), several examples of mature, bearing citrus here and there in B. county. Two orange trees were planted several years ago from the seeds of oranges brought from Florida. They were very large, and loaded with the most delectable, juicy oranges I have ever eaten. They had been productive for several years, surviving some very harsh cold spells. Another example was a neighbor (next door), who had kumquats, oranges, and grapefruit. They bore fruit heavily the five years I lived next door. And yes, the Giant Swallowtail caterpillars were quite plentiful, too. But citrus success would very much be an exception in that area. Savannah and Beaufort are in zone 8b. In the southeast U.S., the trick to growing citrus, like I am, is to plant larger plants. This can be done by keeping them potted a couple extra years. Or be ready to protect them when they are small. Also, it may be the lucky chance, that you have a few years of mild winters, for the plants to mature more. The last two winters brought us temps in the mid teens, but I lost no trees, due to protection. So far this winter, we have only been down to the mid twenties...so far. I live in zone 8a, and weather permitting, I should have oranges, grapefruit, kumquats, satsumas, and if my NZ Lemonade tree keeps blooming, I may get to try those as well. I know that any given year we could have that arctic blast that may take most if not all my trees out. Parts of Florida have lost whole orchards in the past. You just have to accept it.